Owen Sound, ON – Alexey Melnichuk made 35 saves and Russia scored five times on 18 shots to defeat Team OHL 5-2 in Owen Sound and take a 6-3 (points) lead in the 2017 CIBC Canada Russia Series. Artyom Manukyan and Alexey Polodyan both scored twice while OHL talent played a large part in the Russian victory as Dmitri Samorukov (Guelph Storm), Alexey Lipanov (Barrie Colts) and Dmitry Sokolov (Sudbury Wolves) all found the scoresheet. “Altogether I thought we played pretty well,” said three-year Team OHL veteran Will Bitten (Hamilton Bulldogs). “We had a lot of shots and scoring opportunities but their goaltender was outstanding. Team OHL captain Taylor Raddysh (Erie Otters) opened the scoring, converting on a penalty shot at the CIBC Canada Russia Series for the second straight year. The big winger beat Melnichuk inside the far post on a quick release just 36 seconds into action. The Russians didn’t need long to draw even though as new recruit Dmitri Samorukov (Guelph Storm) blasted a point shot past his OHL counterpart and fellow Edmonton Oilers prospect Dylan Wells (Peterborough Petes) in the Team OHL crease. The tying goal came off a Russian offensive zone faceoff win as the game was knotted at one at 7:31. After a trio of high quality Melnichuk saves off Bitten and Jordan Kyrou (Sarnia Sting), the Russians climbed ahead on the power play, ending an 0-for-14 slide on the man advantage dating back to 2015. Tampa Bay Lightning prospect Alexey Lipanov (Barrie Colts) blazed down the right wing, opening up a lane for an oncoming Artyom Manukyan speeding down the middle for an open net finish at 16:24. Team OHL outshot Russia 16-7 but trailed 2-1 after 20 minutes. The two sides traded quick goals in the opening half of the second period as Florida Panthers prospect Adam Mascherin (Kitchener Rangers) finished off a pretty power play passing sequence in the goalmouth. Buffalo Sabres draftee Cliff Pu found a waiting Mascherin 7:59 into the frame as he drew Team OHL even at two. Russia regained the lead less than two minutes later though as Manukyan, who set a record with 105 points in Russia’s top Junior Circuit last season, found his second of the night. Minnesota Wild prospect Dmitry Sokolov (Sudbury Wolves) took an outlet pass from Lipanov on a quick transition play after Team OHL failed to enter the offensive zone, dishing to an open Manukyan who made it 3-2 at 9:43 of the second. Alexey Polodyan took out an insurance policy on the Russian lead before the second expired, scoring a highlight reel goal as he danced around two OHL defenders to beat Wells under the arm at 16:15. Russia led 4-2 after two periods despite being outshot 28-14. Big saves and timely scoring give Russia a 5-2 win in Game 3 of the @CIBC #CANvsRUS Series in Owen Sound. Though Team OHL controlled the pace in the third, their offensive efforts were thwarted by the fine play of Melnichuk as Polodyan would eventually find his second of the night into an empty net with 52 seconds remaining. Team OHL outshot Russia 37-18 on the night, but the scoreboard told another story in a 5-2 loss. 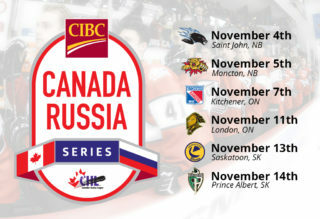 Russia improves to 5-4-0-0 against the OHL over the past five years at the CIBC Canada Russia Series. Nine OHL players will remain in the lineup on Monday night when series shifts to Sudbury for Game 4. Catch Monday’s action on Sportsnet Ontario, East and Pacific when the puck drops at 7:00pm ET/4:00pm PT.